The wild animals of Asia take centre stage in Ride The Tiger. Created by Playtech, it’s a 5 reel, 50 payline video slot that comes with stacked symbols and a feature that awards up to 15 free spins with wilds added after each free spin. Stakes on all devices start at 50p, rising to £500 per spin. Playtech has created a well-designed video slot here. At the back of the reels you’ll see a drawing of a traditional Chinese rural scene. The reels are set within a scroll and feature A to 9 royal values alongside a selection of golden animals often associated with China. You’ll see monkeys and tortoises which pay up to 8 times your total bet per payline as well as fish and birds which will get you 10 times your bet if you land 5 on a payline. The most rewarding symbol is the tiger of the title. Land 5 of these in combination and your reward will be a payout equal to 20 times your total bet – the tiger spins in a fully stacked formation on all 5 reels and can deliver some large clusters of matching symbols. Helping to create those winning combinations is the black and white yin and yang symbol which is the wild. As usual, it replaces everything bar the scatter. The wild can land anywhere apart from reel 1. The game’s only bonus round, the Free Spins feature, is triggered by landing the gemstone scatter on reels 1, 2 and 3 on the same spin. After receiving a payout of 4 times your total bet, you’ll be awarded 10 free spins. After each free spin, 1 extra wild is added to reels 2, 3, 4 or 5. Land another 3 scatters and an extra 5 free spins are added to your total. That’s your lot as far as features goes. The gameplay is a little on the vanilla side but the extra wilds that are added during the free spins can have a big impact. We found that bonus round quite tricky to find. We’d put the variance in the medium category with top payouts of 1,000 times your bet on each spin/free spin. There’s nothing especially innovative on offer in Ride The Tiger. It’s all perfectly solid though. The visuals are nicely done and the feature round, when you do manage to land it, offers some decent potential. 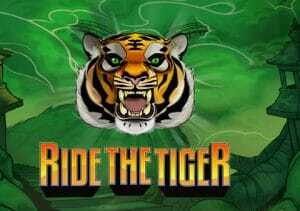 If you like the wild Asian theme, then Ride The Tiger is a video slot to consider. Playtech does offer many better titles though with Call of the Valkyries and Legend of the Jaguar 2 I recommend. T&Cs Apply 18+. New customers only. 10 Free Spins on registration and mobile verification (UK Only). 100% deposit match up to £200. Available on selected Games only. 7-day expiry on Bonus. 40x wagering (max bet £5) before Bonus Balance can be withdrawn. Wagering is with real money first. Game contribution weightings apply to wagering requirements. £10 min deposit + 2.5% fee (min 50p). Not available using Neteller or Skrill. Cash balance withdrawable anytime + £2.50 fee. Full T&Cs apply. T&Cs Apply 18+. New customers only. 100% matched bonus up to £250. 30-day expiry on Bonus. 35x wagering (max bet £5) before Bonus funds can be withdrawn. Wagering is with real money first. Game contribution weightings apply. £5 min deposit. Not available using NETeller or Skrill. Up to 150 Free Spins on deposit. 35x wagering on free spins £10 Match Play in any Cashino venue for £25+ deposit. Full T&Cs apply. begambleaware.org.